Sundance makes you feel like you’re living in a Caribbean palace. With expansive design and elegant decor, plus a full staff, you’ll feel like luxury. The outdoor terrace and pool deck are so spacious and perfect for relaxing in the shade or soaking up the sun. You’ll also get two golf carts for fast access Tryall Club’s private beaches, tennis center, champion-status golf course, and restaurants. Sundance is surrounded by lush gardens and blue skies on Mahogany Drive. 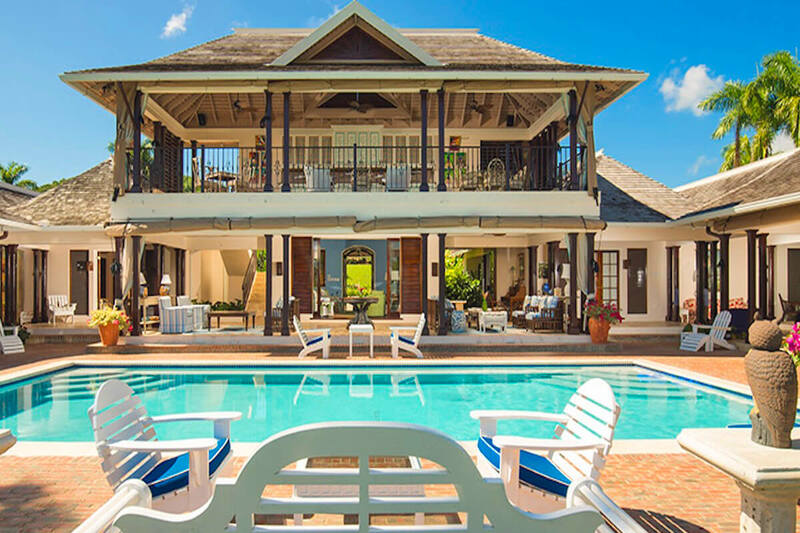 The villa is built on one level, and blends Caribbean and Mediterranean architecture. Beautifully landscaped gardens wind throughout the property and lead to the tennis courts, a swimming pool, and the golf course. Sundance’s veranda runs along the entire width of the house, and flows seamlessly from the dining gazebo to the pool gazebo and a bar with a large TV and an elegant indoor sitting room. The large, solar-heated swimming pool is in the center of the veranda, and a short flight of stairs leads up to a terrace bar and a second dining area. In the lower enclosed gazebo, there’s a private gym. There are also three golf carts for guests to take to Tryall Club’s various amenities, which include a golf course, restaurants, fitness center, and water sports. Designer fabrics, a vast collection of paintings, and curated furnishings add elegance and beauty to this resort villa. There’s an iPhone dock in the living room, WiFi throughout, and Bluetooth in the living room and all the bars. Sundance is staffed with a butler, a chef, two housekeepers, a laundress, and two gardeners. All seven bedrooms have air-conditioning, flatscreen TVs, and ensuite bathrooms. Four have king beds and three have twins that convert to a king. One king suite and two twin suites have a bathtub, and another king suite has an indoor and outdoor shower. The owner’s suite is available at full capacity, and comprises a large bedroom with a bathroom, a sitting room, and a covered veranda. Tryall Club offers tennis, private beaches, and a full range with a pro shop. There’s several restaurants and water sports within the resort, so guests never have to go far for fun. Airport transfers can be arranged (guest expense).